I’ve been looking forward to this since I first read about it in the Pink Section of the San Francisco Chronicle on Sunday. The Last Edition, a 1925 silent film / drama that pits newspapermen against corruption will be shown at the San Francisco Silent Film Festival on Sunday, July 21 at 3:30pm at that Castro Theatre. Stephen Horne will be providing the musical accompaniment. 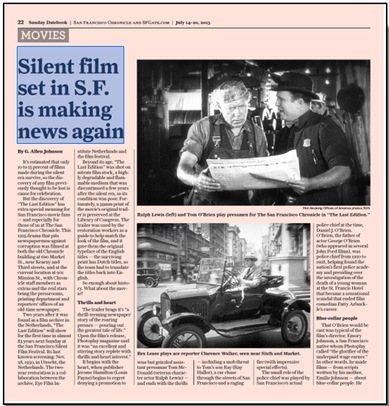 This will be a special treat for San Franciscans, because it was filmed at both the old Chronicle building at 690 Market St., near Kearny and Third streets, and at the current location at 901 Mission St., with Chronicle staff members as extras and the real stars being the pressrooms, printing department and reporters’ offices of an old-time newspaper. Of course, I’m amazed that something from 1925 survived. There was a stat mentioned in the story stating that only an estimated 10 to 15 percent of films made during the silent era survive. Not surprising to me because back in those days, we were making films on highly flammable stock. In fact, the first feature I did with Mary Pickford (“The Foundling”) burned up before prints were made for distribution. We were hugely disappointed. On the bright side, I was hired by World Productions in Fort Lee, New Jersey shortly after it happened. 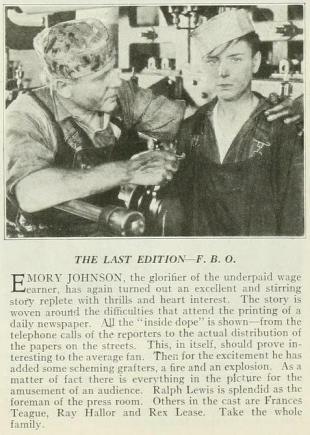 Anyway, “The Last Edition,” is one in a series of films created by Emory Johnson in the mid-1920s. He liked to shoot in the San Francisco Bay Area and his films featured blue-collar protagonists such as policemen, railroad engineers, printers, mailmen, and baseball players. My mate Frankie would approve. I will enjoy watching this film (It has a total running time of 105 minutes) because outside of the story itself, it will showcase areas I knew well back in the day. I was raised in San Francisco and had a front row seat (literally) for the 1906 earthquake and fire. I also spent my share of time as a “cub reporter” for Hearst’s paper. I’m sure that seeing chases through the city, newspaper production from press to print, and a “stop the presses” moment that includes a dramatic fire and rescue, will bring back memories. The guys (Frankie, Doc, Joey and Tommie) were amazed to learn that this film existed and was restored using a 35mm print of the movie’s original trailer which is preserved at the Library of Congress (and available online — see below). The restoration workers were able to match the look of the film — including the original typeface of the English titles. Frankie leaves Sennett and helps Langdon with his film company. His first opportunity to be involved in independent filmmaking. On 25-Feb, Joey anchored his 2-mile relay team to victory over Yale. Throughout the year, he traveled to AAU meets for NYAC. Frannie’s novel, “The Rise and Fall of Minnie Flynn: The Tragedy of Success” was serialized in Pictorial Review and first published in March. 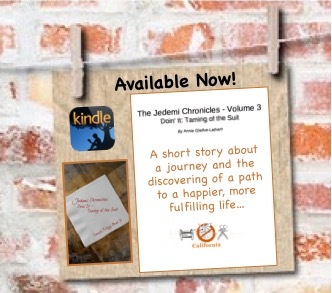 It was the tale of a poor young girl from the New York tenements climbing to stardom through luck and fate without learning enough about herself and the world around her to maintain her good fortune. In June, Doc published his article, “Vagabonding Through Dixie” which described his walk from Chicago through the South which took place in 1921. The summer of 1925 was when the famous party- trip to Pamplona by Hemingway & friends (including Fitzgerald) took place. It was immortalized in “The Sun Also Rises” (published in 1926). In July the Scopes Evolution Trial took place. William Jennings Bryan said “Destiny is not a matter of chance; it is a matter of choice. It is not a thing to be waited for; it is a thing to achieve. In August, Frannie, her husband Fred and Silver King his horse, lead the parade in SF promoting “The Greater Movie Season” — an initiative to promote all movies. The parade route started at the Ferry Building at the foot of Market Street and ended up at the Civic Center. The horse stole the show and was featured on the front pages of the local papers. In November, “Stella Dallas” was released. Frannie wrote the “scenario” which she adapted from the popular novel — mixing comedy scenes with drama. It ended up being the highest grossing film to date for Samuel Goldwyn. Whatever you end up doing, love it.